IT professionals face a new set of challenges for performance and resource management on a regular basis. Cloud infrastructures are based on sharing highly virtualized resources and operating environments handling a huge amount of workload to support day to day tasks of organizations. Therefore, it is necessary to ensure that the performance of your cloud environment does not degrade, and you can start with a minimum level of optimization in AWS EC2 instances to achieve better throughputs. How overpopulating your AWS EC2 instances with security group rules decreases cloud performance? Potentially, users can have hundreds or even thousands of EC2 instances running in their infrastructure. Launching EC2 instances in a VPC (Virtual Private Cloud) allows users to control the security of their associated instances. Users can attach one or more security groups to multiple instances specifying security rules. 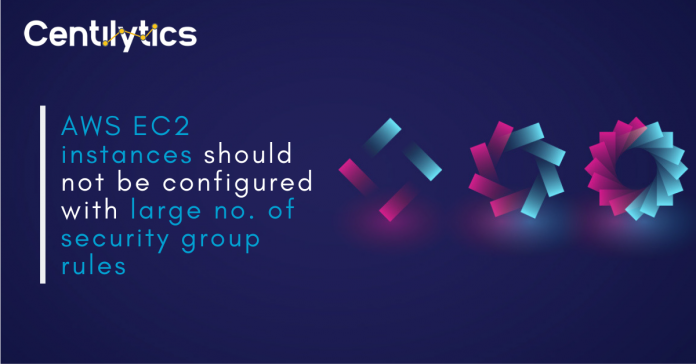 In order to ensure higher-level of performance of your cloud infrastructure, it is recommended not to configure EC2-VPC or EC2-classic instances with a large number of security group rules. Configuring AWS EC2 instances with large no. of security group rules increases latency i.e. it leads to a delay in transferring and processing data which severely affects the performance of the cloud infrastructure as most of the workload is deployed on EC2. How does Centilytics help you? Centilytics provides a performance optimizing practice which specifies the no. of rules attached to numerous EC2 instances and warns user whenever a large number of security group rules get configured. It further recommends you to pay attention to the security group rules attached to your EC2 instances and configure them properly to ensure optimized cloud performance. This dedicated insight on security rules applied to EC2 instances helps users in determining the performance of their all EC2 instances running in their cloud infrastructure. Warning This indication will be displayed when an EC2-VPC instance has more than 50 security rules in the corresponding security group in which it is attached OR if an EC2-classic instance has more than 100 security group rules in the attached security group. OK This indication will be displayed when an EC2-VPC instance has less than 50 security rules in the corresponding security group in which it is attached. Region: This column shows the corresponding region in which the resource exists. Identifier: This column shows the corresponding Security group ID associated with the security group. Group Name: This column shows the security group name assigned to your respective AWS EC2 instances. No.of rules: This column shows the number of security rules currently present in corresponding the security group. Resource Tags Applying resource tags filter will display those resources which have been assigned the selected resource tag. For e.g., If the user has tagged some resource by a tag named environment, then selecting an environment from the resource tags filter will display all the data accordingly. Resource Tags Value Applying resource tags value filter will display data which will have the selected resource tag value. For e.g., If the user has tagged some resource by a tag named environment and has given it a value say production (environment: production), then the user will be able to view data of all the resources which are tagged as “environment:production”. The user can use the tag value filter only when a tag name has been provided. You can read more about Amazon Elastic Compute Cloud (EC2) here. Next articleContainers Vs VMs | Which one is better for deployment?